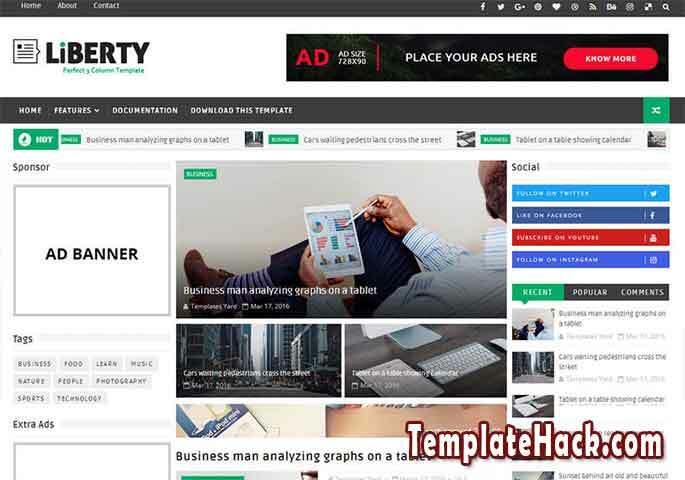 TemplateHack.com - Download Liberty 3 Column premium blogger template. Liberty 3 Column is one of the best magazine blogspot template in the world. I really recommended this template if you are searching on the template can make your blog look professionally like big portal websites. Liberty has elegant features such as ads ready, social bookmark to connect your official social media account, tabbed widget is latest recent, popular and comments inside, breaking news in the bottom of page navigation and grid style to get more ads CTR. Ads Ready, Breadcrumbs, Breaking News, Customizable, Featured Post, Grid, High CTR, HTML5 Valid, Page Navigation Menu, Post Thumbnails, Responsive, Search Box Button, SEO Friendly, Social Bookmark Ready, Social Share Button, Whatsapp Sharing Button, Clean, Elegant, 1 Right Sidebar, 1 Left Sidebar, Green, White, Orange, 3 Columns, Tabbed Widget, 3 Columns Footer. Adapted From Wordpress blogger template, Business blogger template, Entertainment blogger template, Gadget blogger template, Games blogger template, Lifestyle blogger template, Magazine blogger template, News blogger template, Newspaper blogger template, Portal blogger template, Reviews blogger template, Tech blogger template, Technology blogger template, Viral blogger template, Wordpress Look blogger template, Retina blogger template, Tips and Trick blogger template, Wallpaper blogger template.